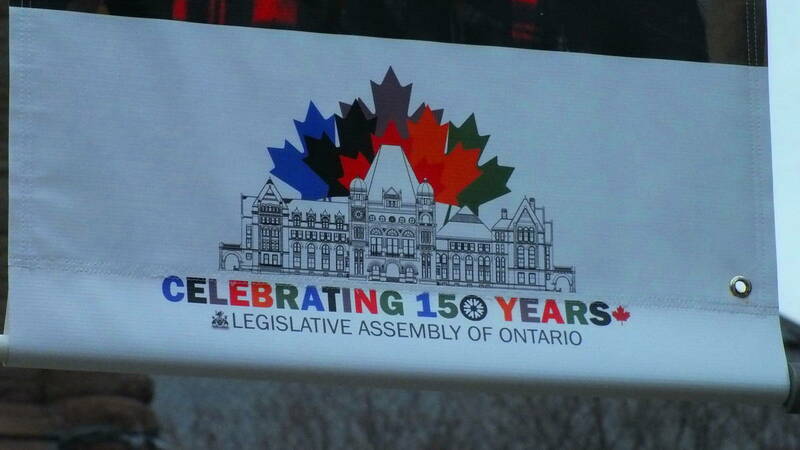 An initiative by the Lieutenant Governor of Ontario, the Honourable Elizabeth Dowdeswell, to commemorate Canada’s 150th birthday resulted in this marvelous compilation of 150 stories that examine what it means to be Canadian living in Ontario. Each story is paired with a relevant photograph. 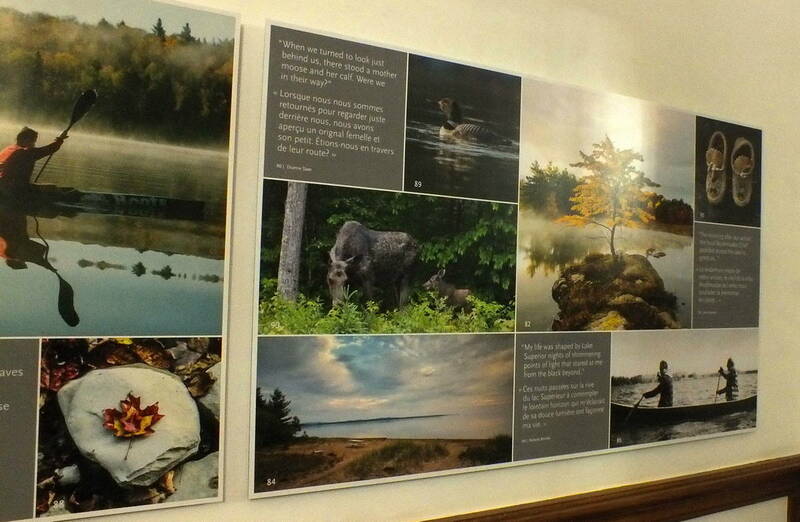 It was early in January 2017 when we were contacted by a representative of the Lieutenant Governor’s office requesting the use of one of our snapshots that had been taken in Algonquin Provincial Park. 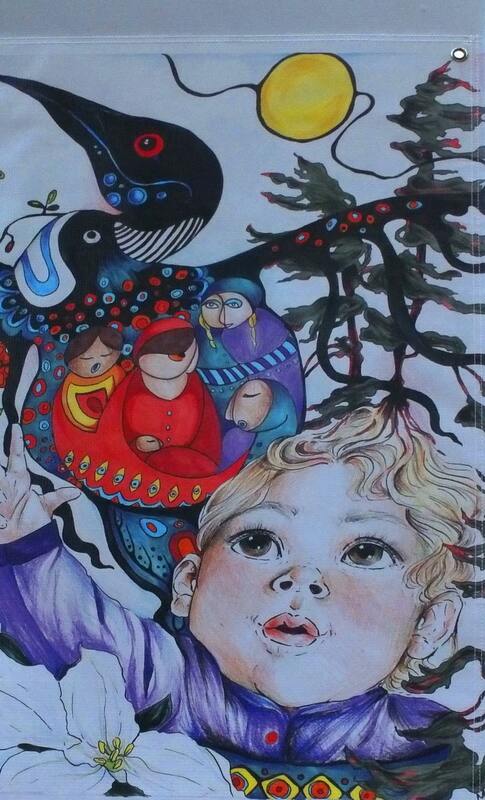 They wished it to accompany a short story contributed by Dianne Saxe, the Environmental Commissioner of Ontario. Needless to say, we were delighted. 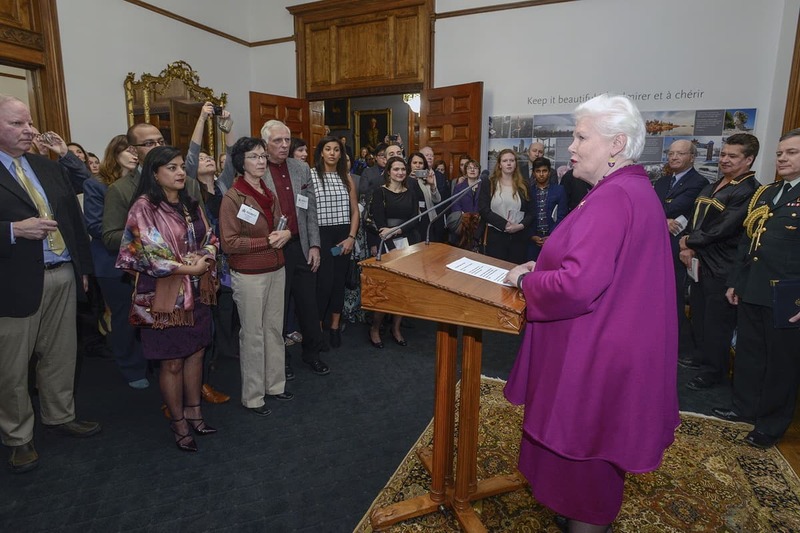 As a courtesy, to thank everyone for their contribution to the book, the Honourable Elizabeth Dowdeswell invited each contributor and one guest to the book launch that would be held at Queen’s Park in Toronto. With such a long list of guests, the reception was divided between two evenings in order to accommodate everyone and their schedules. 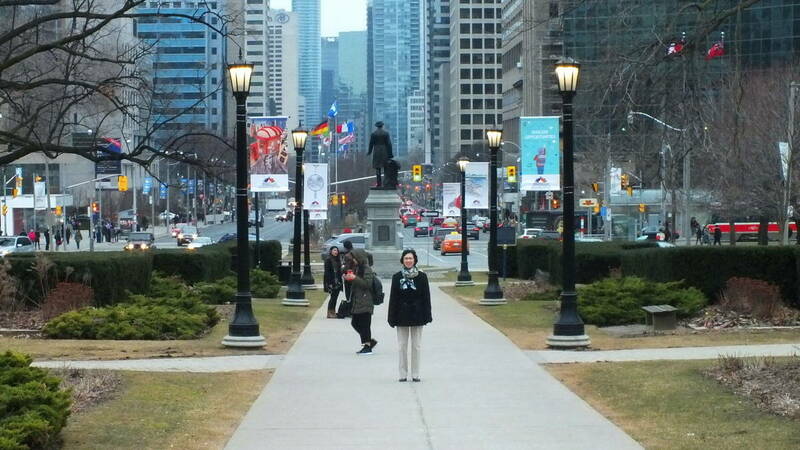 and banners that have been hung from the lamp posts, each one an expression of some significance and relating to Canada’s 150th birthday as interpreted by its designer. 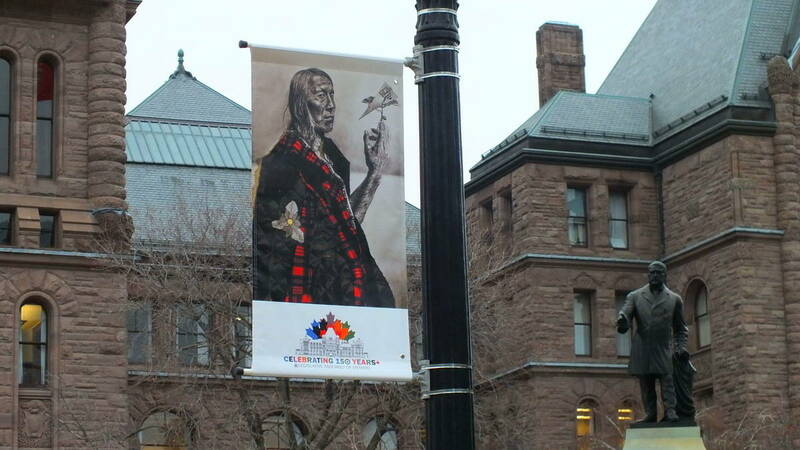 Each banner features a winning design by a young Ontario artist who submitted their unique entry into a contest to earn this place of honour. I was blown away by what I saw, and the display elevated a routine walk into a memorable procession. 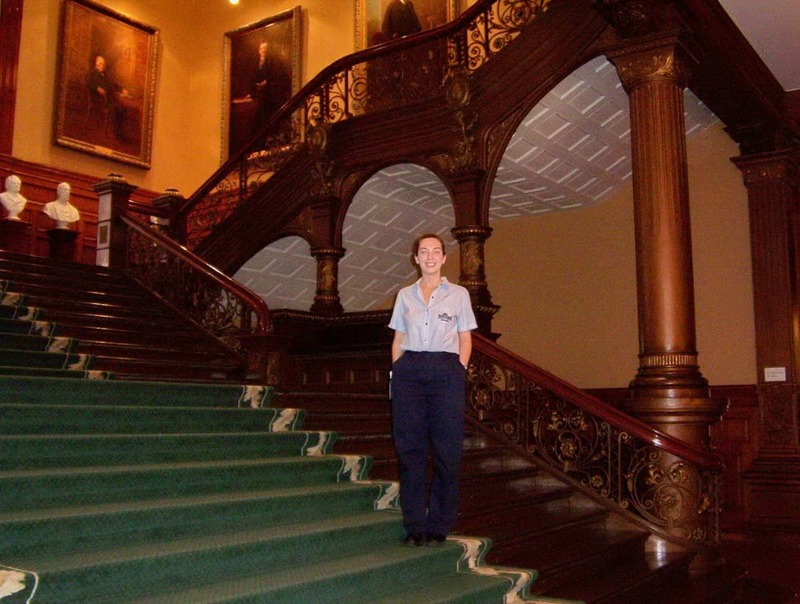 The last time Bob and I visited Queen’s Park was in 2003 when our daughter worked there as an Interpretive Officer in the Inter-Parliamentary Public Relations Branch for the Lieutenant Governor’s office. 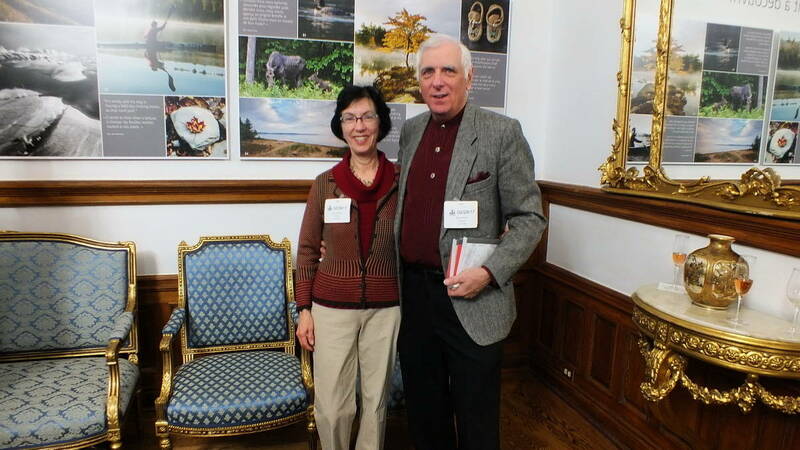 On that occasion, we did not have the opportunity to visit the Lieutenant Governor’s Suite. 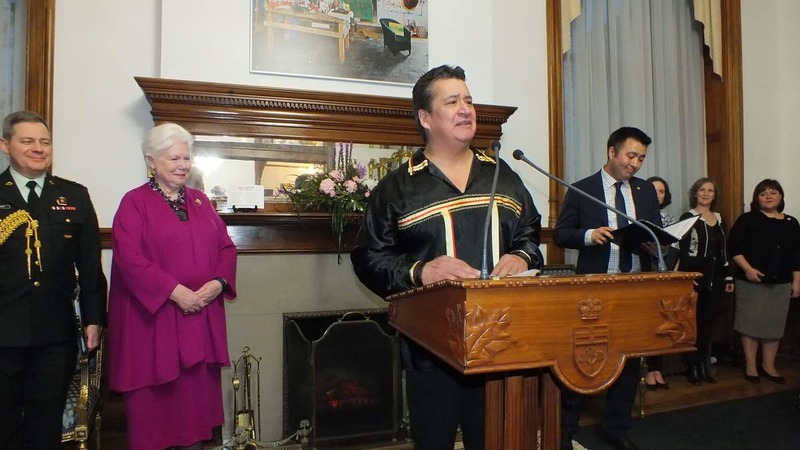 The book launch, however, did take place in the Lieutenant Governor’s Suite, a 2-storey assemblage of rooms where the Honourable Elizabeth Dowdeswell hosts guests and dignitaries for official functions. 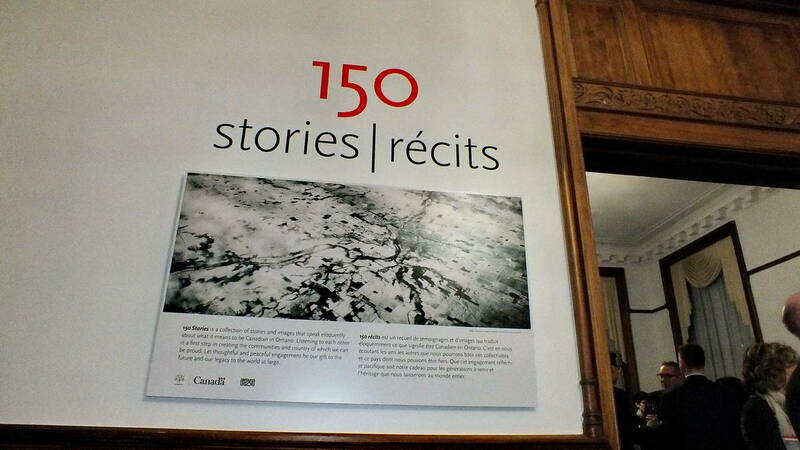 Each guest and contributor to 150 Stories was asked to sign the Guest Book. 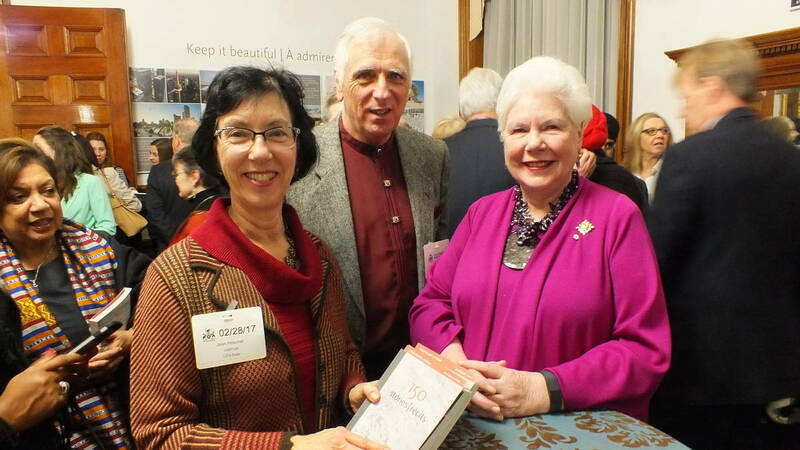 Before entering the Lieutenant Governor’s Suite, the greeters requested that each contributor be photographed with their copy of 150 Stories, and a Thank You letter from the Honourable Elizabeth Dowdeswell was presented to them. 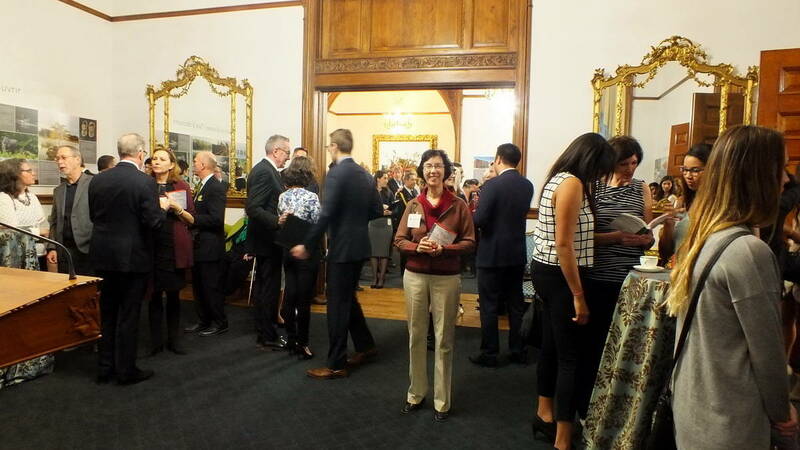 After being offered a celebratory glass of champagne, all guests were welcome to circulate from one State Room to another, between the Foyer, Dining Room, Lounge, Drawing Room, Upper Hall and the Music Room. 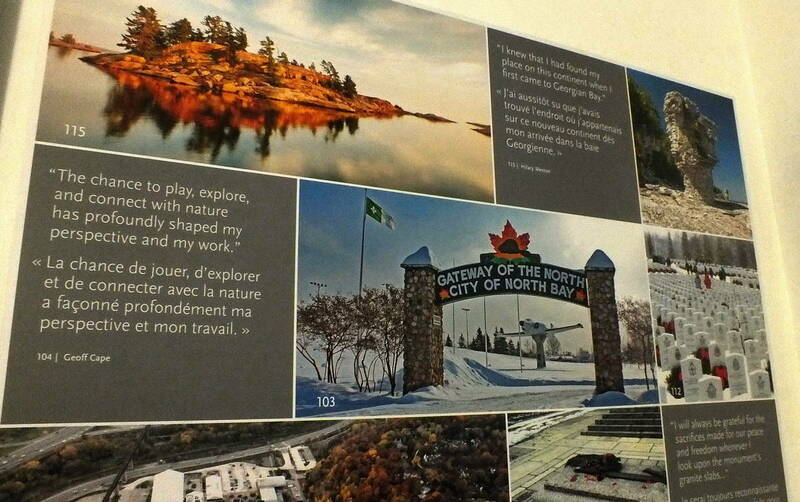 Numerous large-scale mounted montages were on display throughout the various rooms of the Suite. 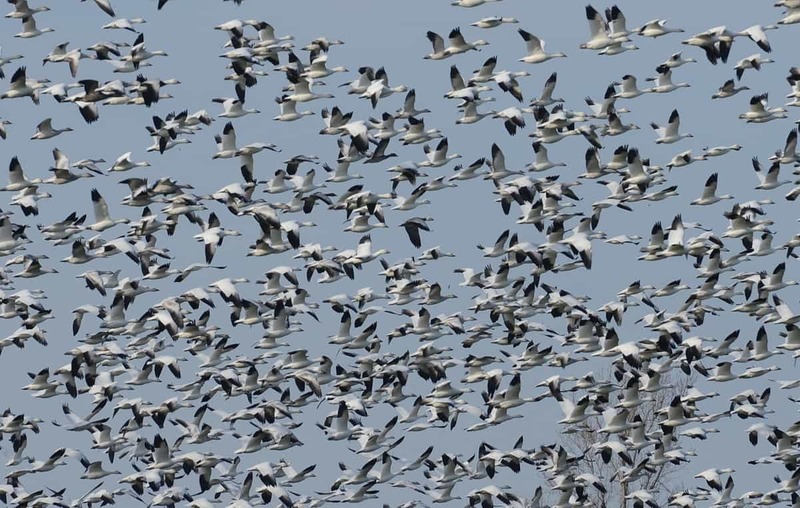 Together, the montages feature all photographs that appear in 150 Stories, and some were accompanied by an excerpt from the story that is paired with the photograph. 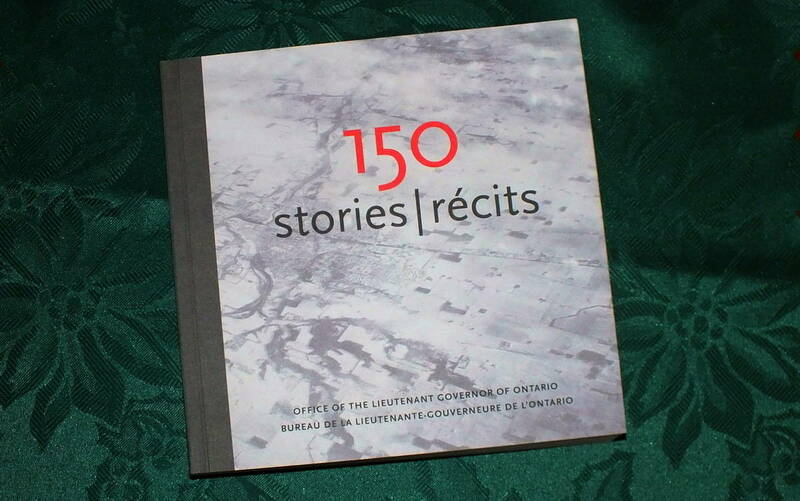 150 Stories is broken into chapters with each chapter focusing on a different aspect of life in Ontario. 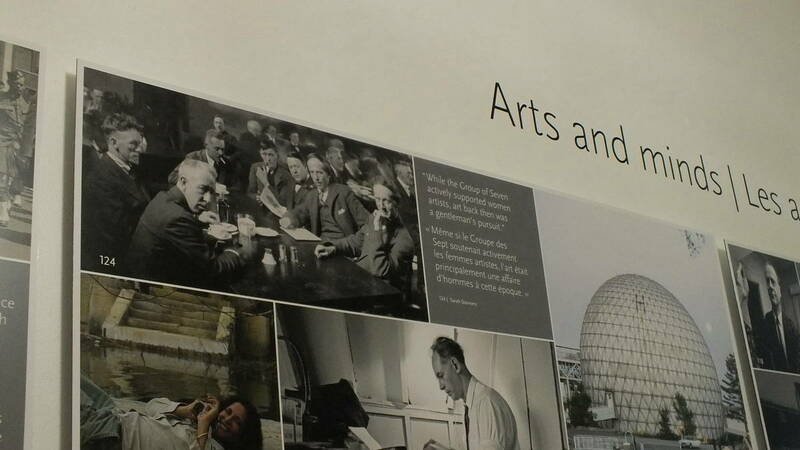 The above montage features photographs and quotations from the chapter Arts & Minds. 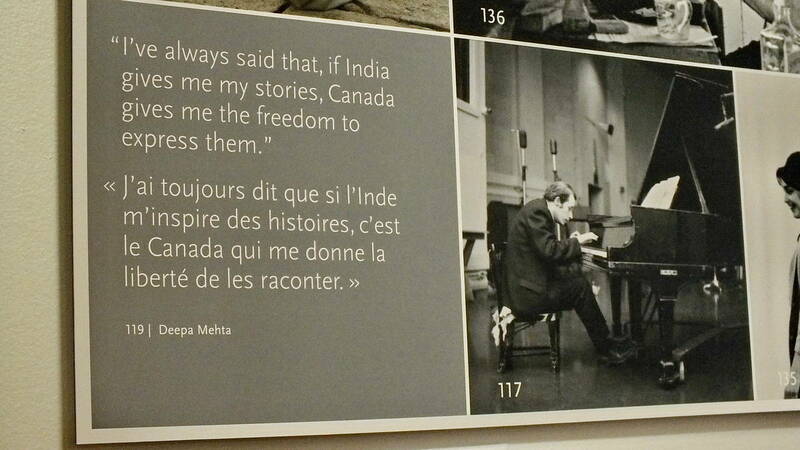 People from all walks of life contributed stories, and in this chapter, we can read narratives by people such as Deepa Mehta, Veronica Tenant, Peter Herrndorf, Charlotte Gray and James Mishibinijima, to name a few. 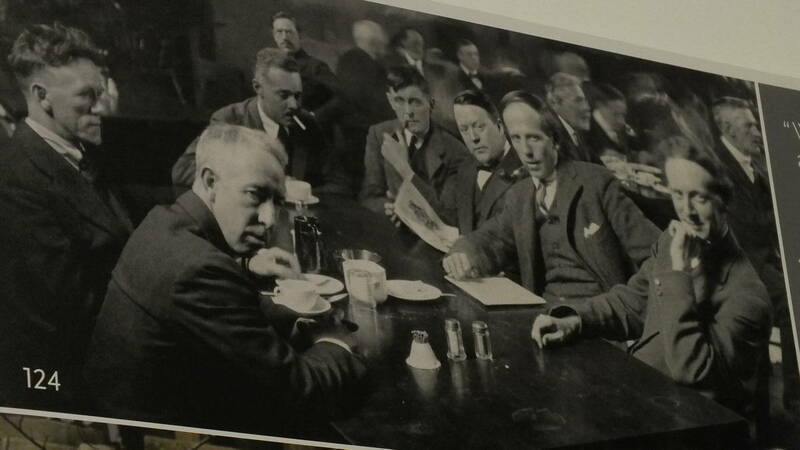 This photo of the Group of Seven was chosen to accompany the story by Sarah Stanners, the Chief Curator of the McMichael Canadian Art Collection. 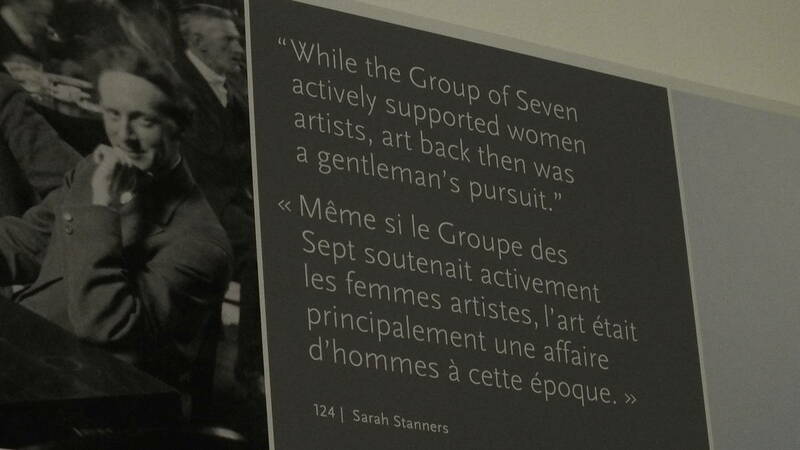 This is an excerpt from Sarah Stanners’ short story that speaks to her experience as a woman in the world of art. that of Glen Gould at the piano. 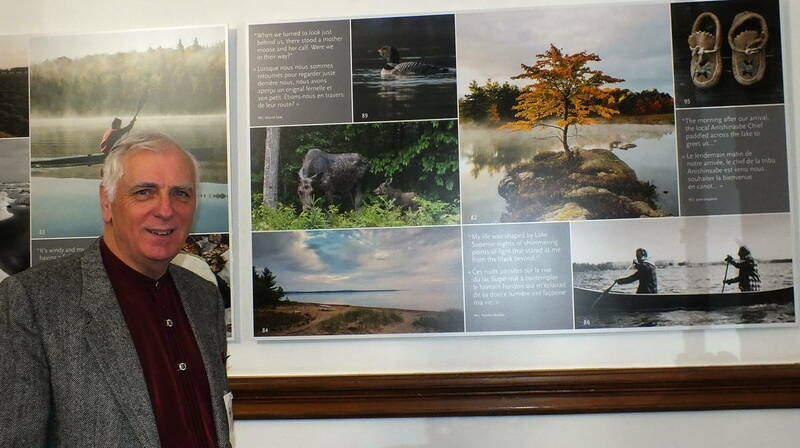 Of course, Bob and I were anxious to locate the montage that displays Bob’s photograph from the chapter Yours to Discover. What a gratifying feeling to find the enlarged image of the Moose cow and calf that Bob snapped one rainy June afternoon. 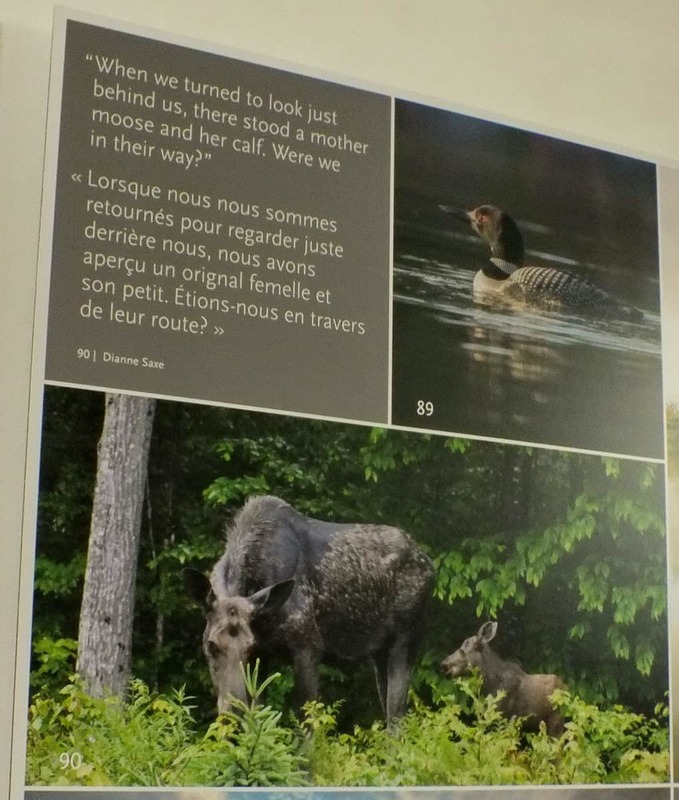 The layout even included a quotation from Dianne Saxe’s story, #90, that speaks to an encounter she had with a pair of Moose in Algonquin; our photo appears at the bottom of Page 136 in the book. The proud and happy couple before the proceedings began. A Master of Ceremonies started things off and introduced the first speaker, the Chief of the Mississaugas of the New Credit First Nation, R. Stacey LaForme. 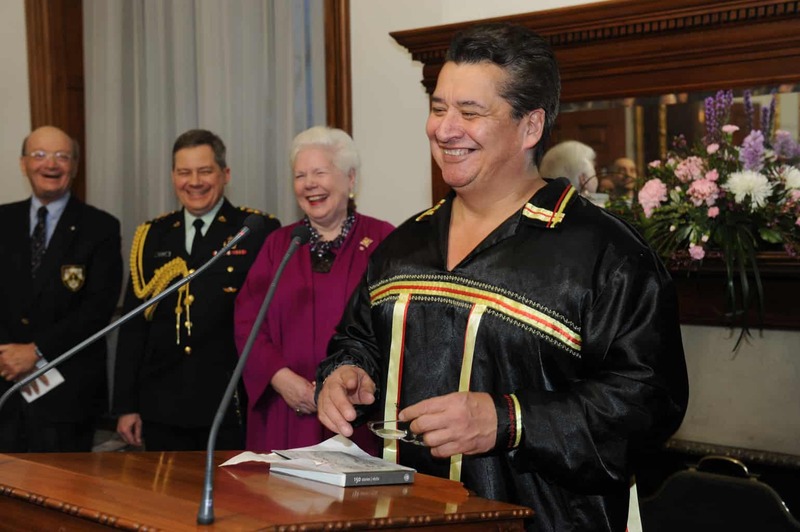 As well as relaying to us the story that he contributed to 150 Stories, Chief LaForme performed a blessing for the gathering of people and for the project. 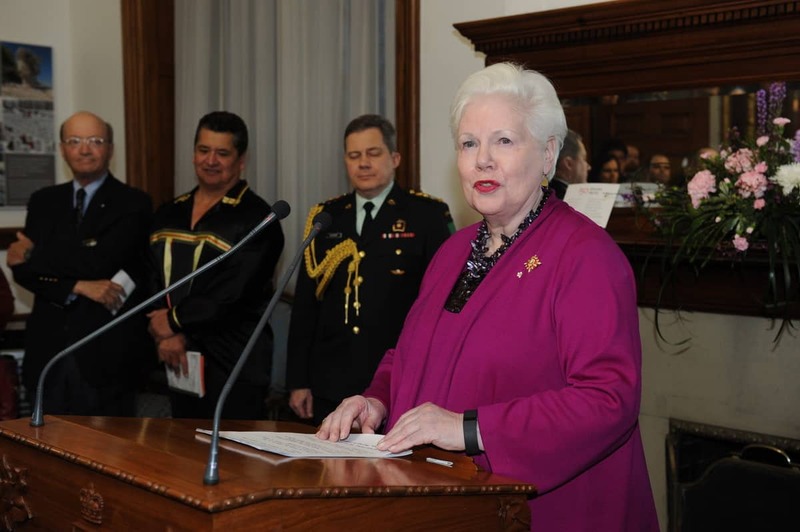 The Honourable Elizabeth Dowdeswell next addressed the crowd. 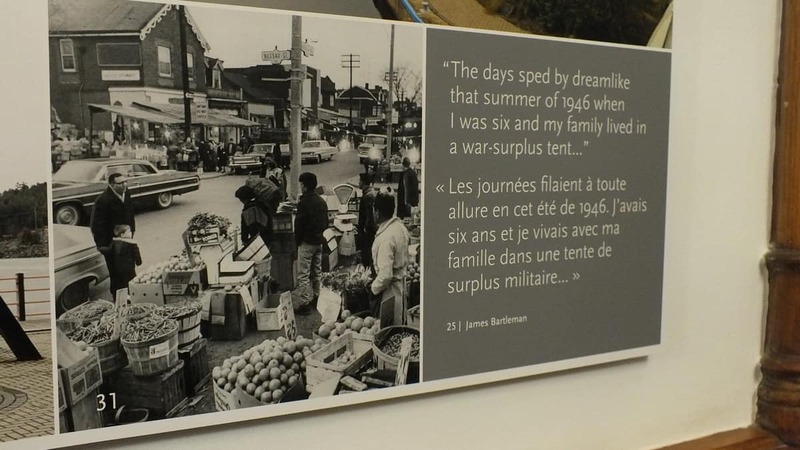 She elaborated on the theme of the book and explained how together the new stories and photographs speak eloquently about what it means to be Canadian living in Ontario. 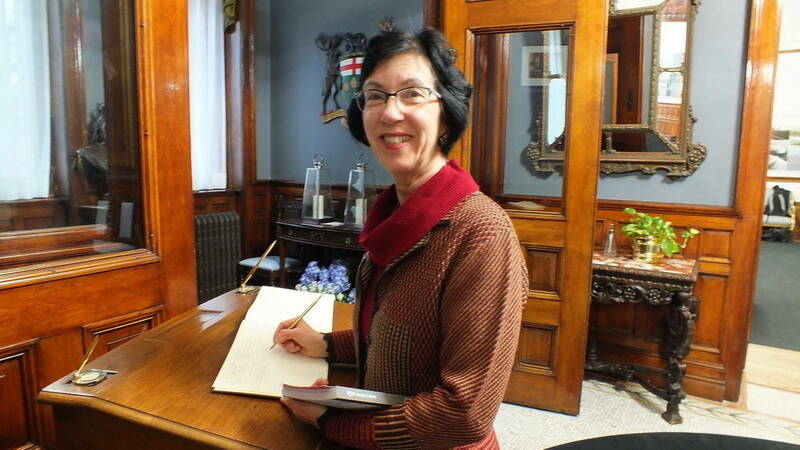 The Lieutenant Governor went on to share a personal experience that she had and how it related to 150 Stories, and lastly she gave heartfelt thanks to all of the contributors who helped to make her project a success. 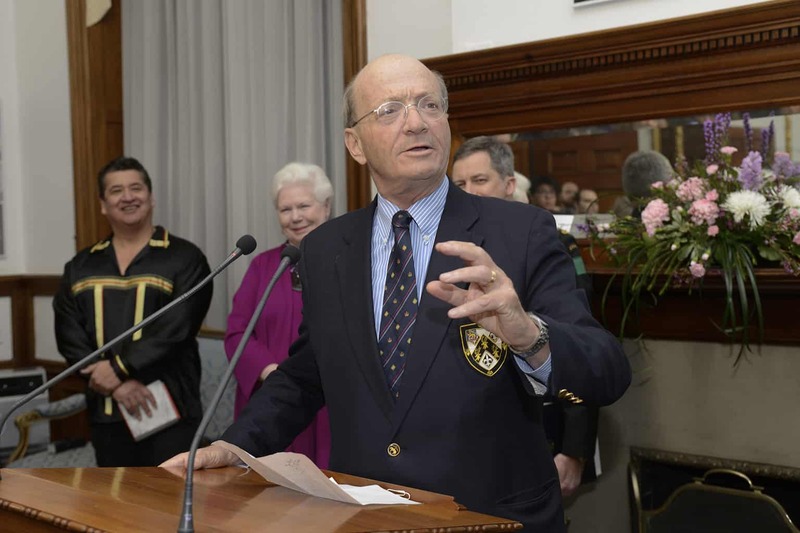 To shed a different light on the content of 150 Stories, the Honourable Hugh Segal was asked to tell his story that is found in the chapter Ontario in the World. It is a brief account of Mr. Segal’s visit to the Canadian Forces serving NATO in Afghanistan. 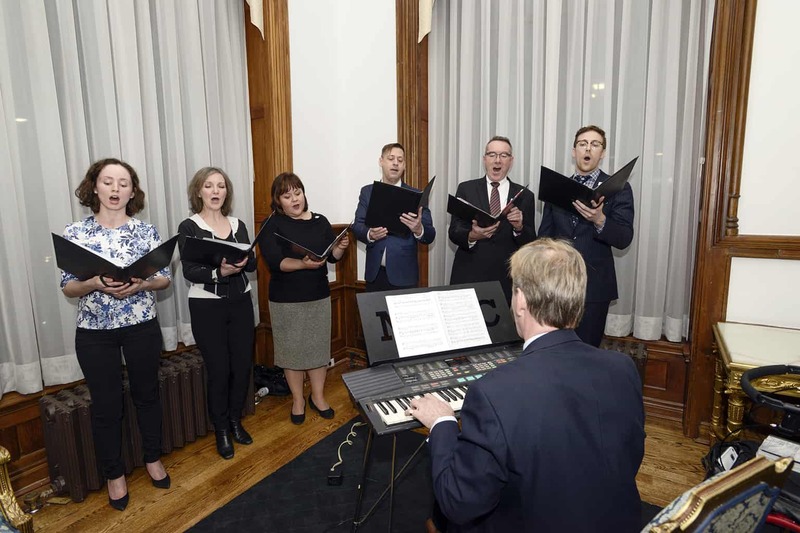 The formal part of the ceremonies wrapped up with a performance by a small group of singers from the Toronto Mendelssohn Choir who sang a rousing rendition of a song familiar to many attendees, A Place to Stand, A Place to Grow. This song was originally written and performed in the Ontario Pavilion at Expo ’67 during the year of Canada’s 100th birthday. 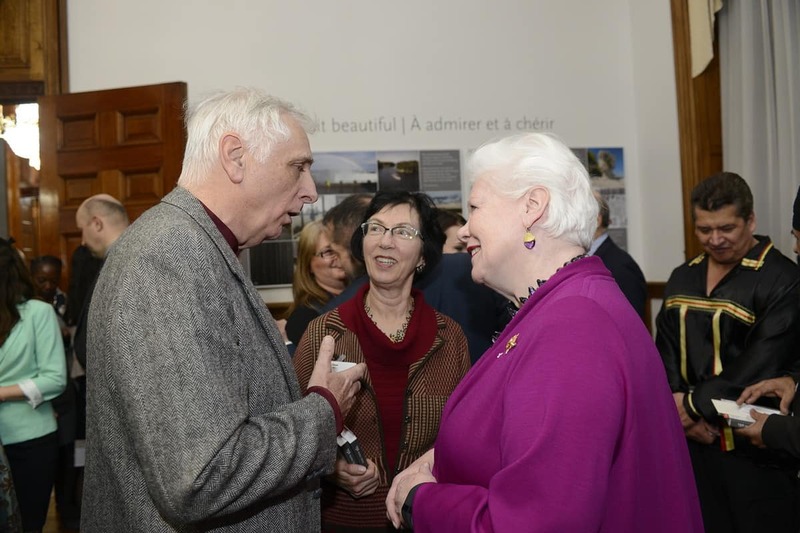 The Honourable Elizabeth Dowdeswell was very gracious and made herself available throughout the remainder of the evening in order to speak with each contributor and/or guest. She was very attentive and seemed to take great pleasure in hearing our own stories or details relating to the chosen photographs. 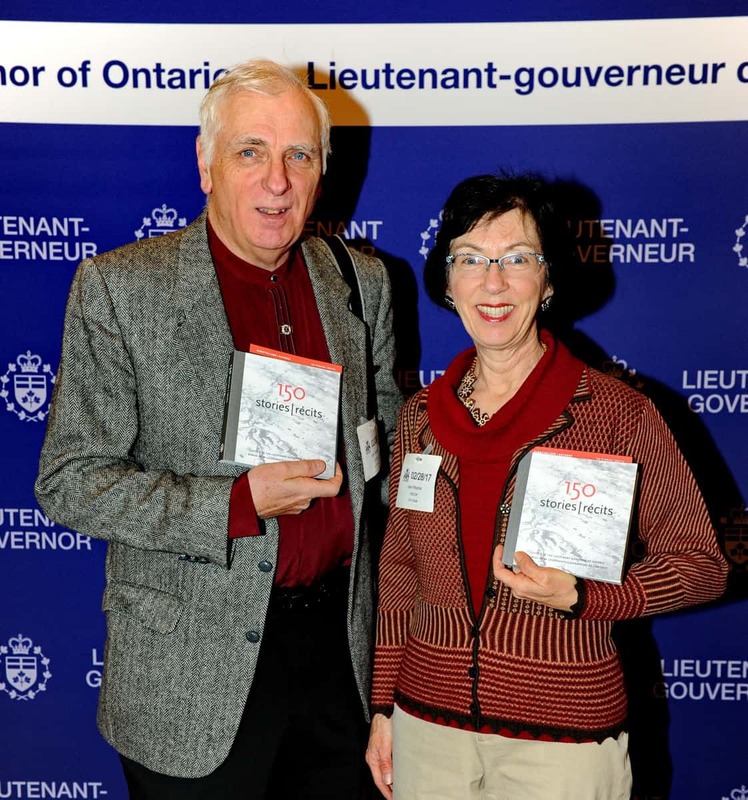 After several minutes spent chatting with Bob and me, the Lieutenant Governor kindly autographed one of our copies of 150 Stories. 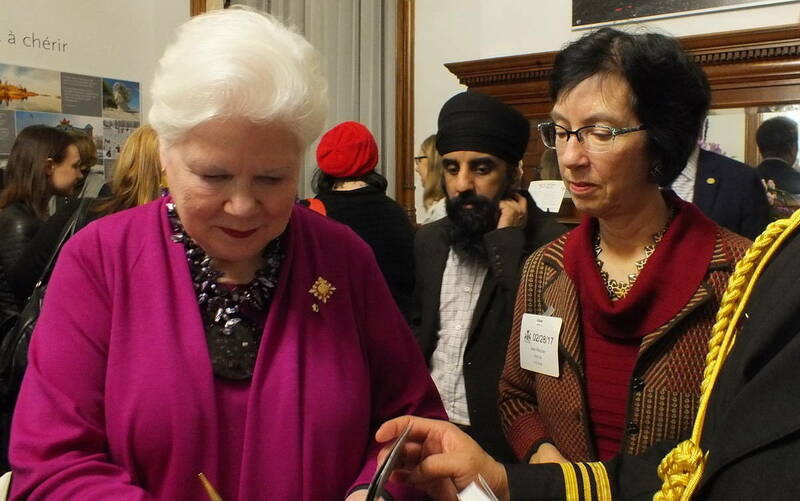 Each guest and contributor was gifted with a copy of the book upon arrival, so the Honourable Elizabeth Dowdeswell was kept busy signing and socializing for most of the evening. The organizers of the book launch did not miss a beat. 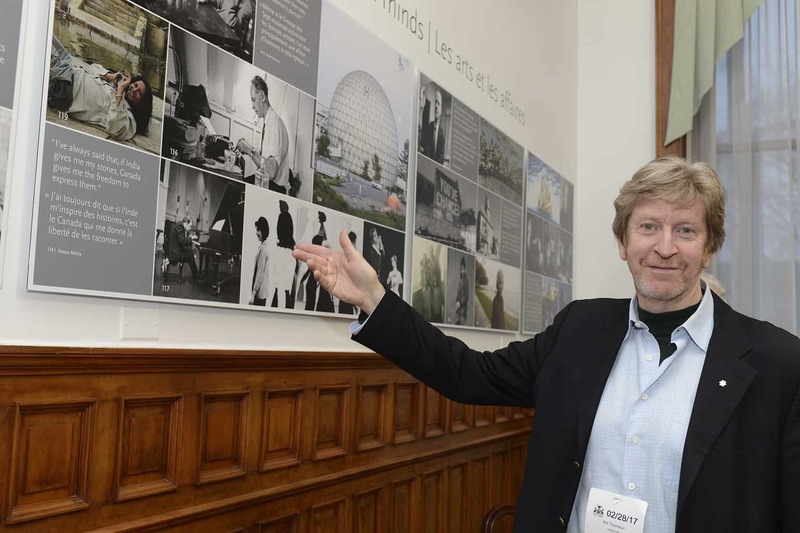 A photographer was engaged to snap a photo of each contributor and guest with the Honourable Elizabeth Dowdeswell as well as to document the event. 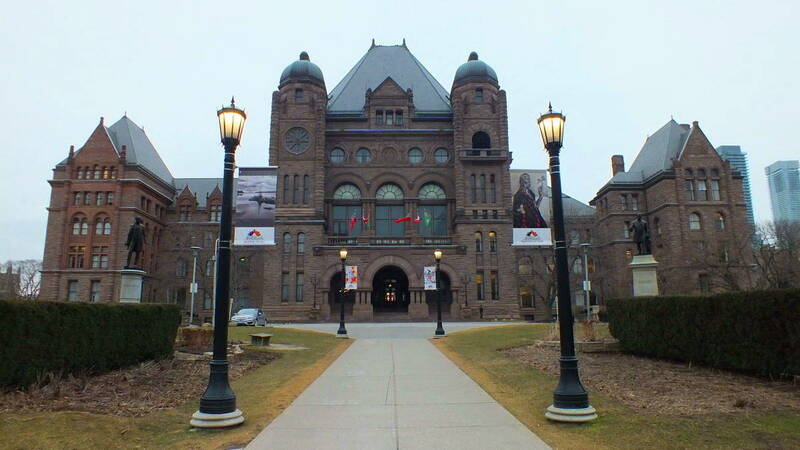 While the Lieutenant Governor took turns chatting with each guest and making herself available for photo ops, the remainder of the guests enjoyed noshing on delicious appetizers proffered by waiters who circulated between rooms. 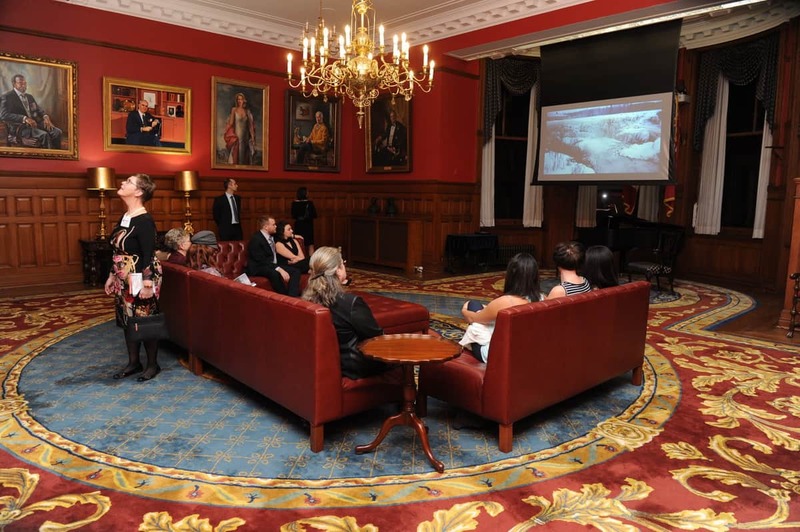 We were at liberty to view films being aired in the Music Room, or simply to mingle and appreciate the many fine portraits of former Lieutenant Governors that are hung throughout the Suite.